Amazing how one can build a story from a single photo. 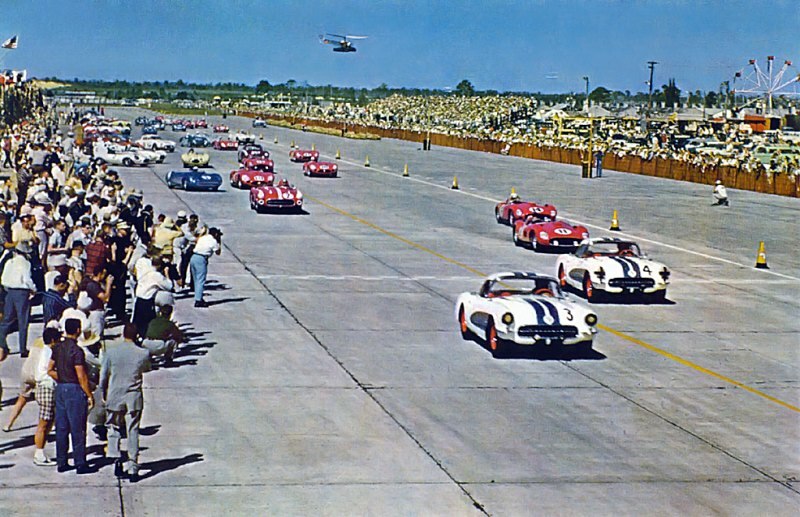 A good friend of mine in Italy sent me this great photo from pit lane at the 1957 Sebring 12 Hour Race, showing Ferrari’s engine maestro Carlo Chiti (pronounced Kee-tee) alongside American Richie Ginther. 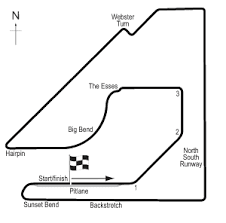 Ginther was there to drive a privately-entered Ferrari 500 Testarossa with fellow American Howard Hively. 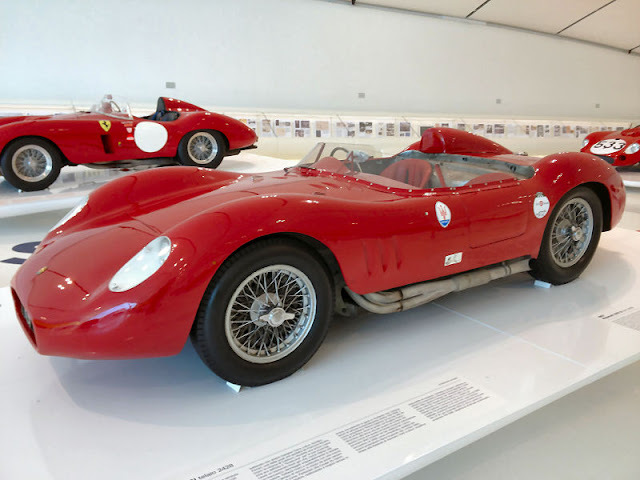 Chiti of course was the architect of all Ferrari’s racing engines at the time, and he was on hand to assist Phil Hill, Oliver Gendebien and Wolfgang von Tripps, all who failed to finish. 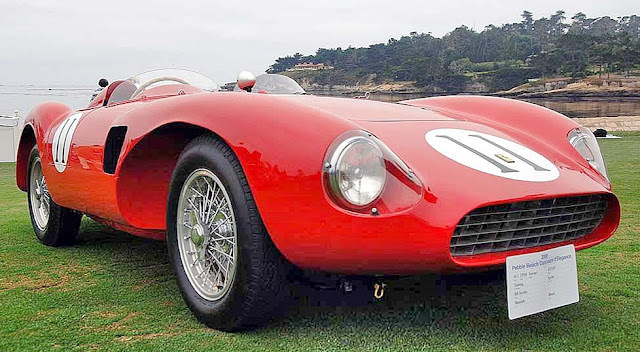 Ginther was just getting started on the sports car scene and lucked out in 1957 when Temple Hoyne Buell Jnr, son of the famous American architect, agreed to sponsor Ginther and Hively in one of the first four cylinder Ferrari Testarossas to be built. 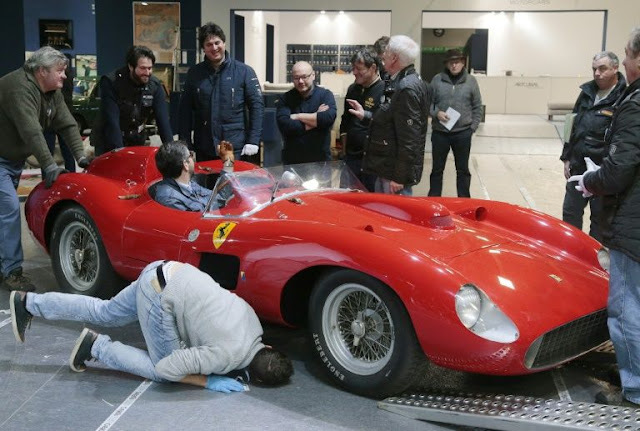 The engine was by Chiti, the body by Scaglietti, and it would go on to bequeath a legendary reputation to one of the most famous Ferrari models ever produced. Scaglietti produced 30 TRs, and three were produced by Touring of Milan, many saying it was a prettier car than Scaglietti’s original. 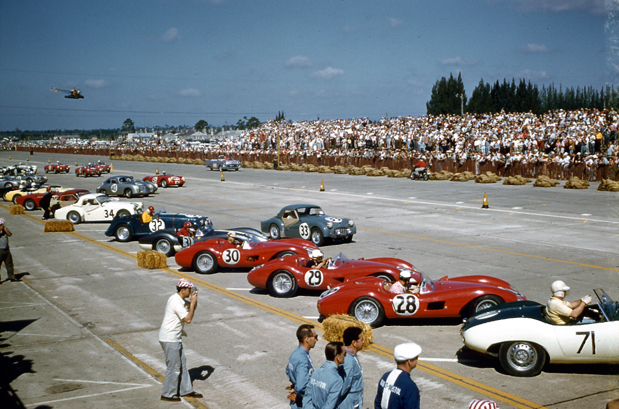 However, the 1957 Sebring race was perhaps more famous for the pre-race shenanigans. Just as the organisers were setting up shop on the Sebring airfield circuit, the FIA decreed that all cars must change the ‘spare’ tyre at the first tyre change. 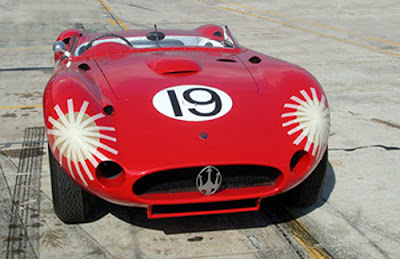 Some cars were unaffected, but the Ferraris and the Maseratis used different size tyres on the front and rear. Eventually British driver Mike Hawthorn and the organisers developed a strong argument which resulted in the FIA backing down and withdrawing their rule. Fangio had won the 1956 race for Ferrari, but Maserati offered him SIX brand new practice cars if he would sign with them. 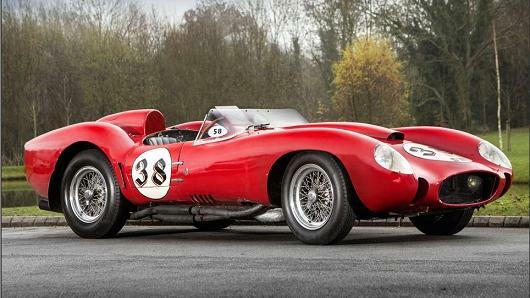 Fangio swapped teams, joining Stirling Moss at Officine Alfieri Maserati. There were 86 cars entered, 76 showed up, and 66 qualified! One of the largest fields ever. 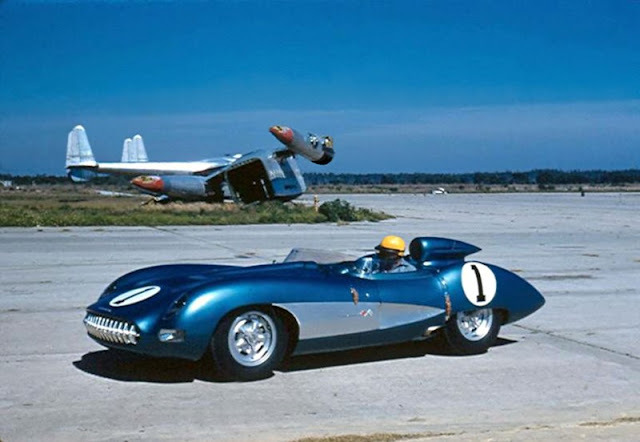 This was the last year that qualifying was to be decided by engine size, rather than lap time, and this put the new 4.6 litre Corvette of John Fitch and Piero Taruffi on pole. In fact the V8 Corvettes filled the first four spots on the grid. The Corvette’s designer Zora Arkus-Duntov created a single lightweight (magnesium-bodied) SS car for Fitch-Taruffi, but it completed only 23 laps before the suspension failed. 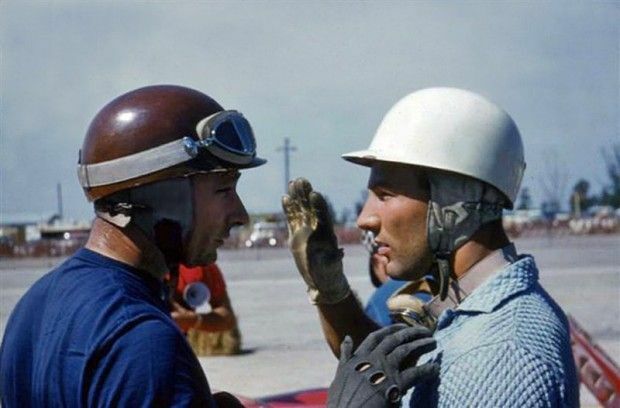 Prior to the race many drivers asked Arkus-Duntov if they could drive the new American racer, but he chose only Fangio and Moss to test it. Within four laps Fangio had smashed the lap record with a time of 3.27.8. Moss was just 0.2 seconds slower in the Corvette! Colin Chapman brought four Lotus 11s, uniquely funding the entry by pre-selling each race car to an American owner who would be allowed a stint in the car, but title wasn’t transferred until the race was over! Fangio and Jean Behra won, with Moss and Harry Schell second. 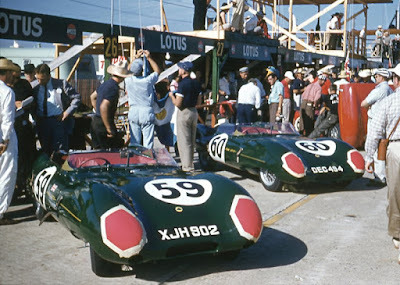 Mike Hawthorn and Ivor Bueb were third in a D-type Jaguar, sponsored by my former employer Jaguar Cars North America. The Ferrari 290S of Masten Gregory and Lou Brero was fourth, with Briggs Cunningham's Jaguar D-type driven by Walt Hangsen and Russ Boss fifth and the factory-entered Ferrari 315S of Peter Collins and Maurice Trintignant was sixth with Alfonso de Portago and Luigi Musso seventh, in the second Ferrari 315S. Ginther and Hively finished tenth. All in all a good race for Ferrari despite Fangio’s team switch; and Chiti went on to develop a great V12 engine for future Testarossas. Back in the mid 60s most American collectors treated TRs as banged-up, clapped-out old race cars, and they rarely sold for more than $65,000. In 2009 Bonhams sold a 1957 500 TR for nine million euros, but the record goes to the sixth-placed Ferrari from the 1957 race, which was sold this year in Paris by auction house Artcurial for 35 million Euros! The car, driven by Peter Collins and Maurice Trintignant in 1957, was owned by the family of former French racer Pierre Bardinon who died in 2012. It’s believed the car was bought by an American, and most people are betting it was Ralph Lauren. Richie Ginther went on to drive for Scuderia Ferrari and won his first F1 race, in Argentina in 1960, in a career that lasted just seven short years. 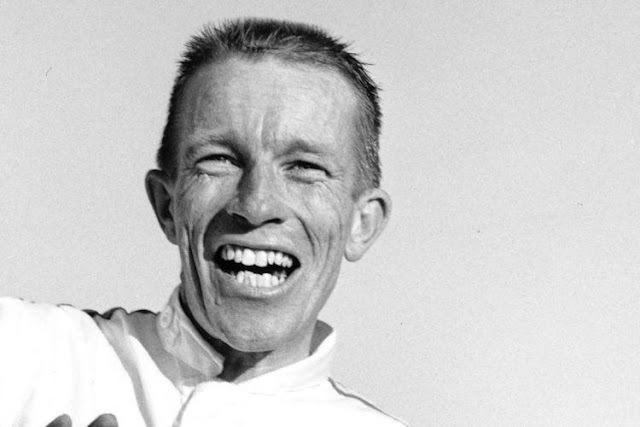 Interestingly Ginther did not die on the racetrack, he passed away while on vacation in France in 1989, from a heart attack.